strategy, design, software development, & database development. For a third year in a row Clutch names Modern Signal 2017 Top Washington, DC & Baltimore Web Development Company. Leaders were selected based on over a dozen quantitative and qualitative factors. A key factor in Modern Signal's selection was consistently high customer service and satisfaction! Modern Signal launches NASFAA's new Compliance Engine, a members-only centralized, collaborative platform that helps members efficiently manage their compliance tasks across their organization. Modern Signal designed and developed a front-end system that enables task assignments, commenting, checklists, and printing of reports. The back-end system includes a form-building tool and integration with iMIS. Brilliant in its simplicity and elegance, Lighthouse CMS offers the best user interface in content management - and top-notch features and options to boot including tools for mobile and responsive design. Now available in ASP.NET and ColdFusion. Modern Signal developed an mobile app for CropLife America that allows its members to easily share their news and connect. Croplife America represents the developers, manufacturers, formulators and distributors of plant science solutions for agriculture and pest management in the United States. Modern Signal worked with the National Association of Legal Professionals to rebrand, redesign and develop PSJD, a comprehensive directory of legal public sectors jobs. PSJD guides law students and practicing lawyers looking to bring their talents to public service. We're working on the mobile website next! Modern Signal is a Washington, DC-area interactive web design and database development firm specializing in complex, enterprise-level website and database solutions. Our veteran team provides the complete range of expertise in software development - strategy, information architecture, project management, application development (primarily in ASP.net and ColdFusion languages), database development, graphic design, and interface development. Since 2001, we have helped associations, non-profits, foundations, and private companies make their mark on the web, and run their businesses efficiently behind the scenes. CLA mobile app is a portal for up-to-date directory, news and events information. Real estate services website featuring responsive design & full CMS with dynamic content tools. With a custom bookmarklet, build your virtual dream closet and get notified of sales. Mobile App: Search and view rankings for nationally recognized doctors, nurses & hospitals. Modern Signal rolls out new text messaging features for Osher Lifelong Learning Institute at American University. The new texting feature allows OLLI to message different groups of recipients based on both pre-defined and ad hoc searches in their member database. Integration with Twilio creates a seamless process for sending messages and managing opt-in/out permissions. OLLI plans to use this feature to communicate critical safety and weather closing information as well as to issue reminders and other notices to the OLLI community. 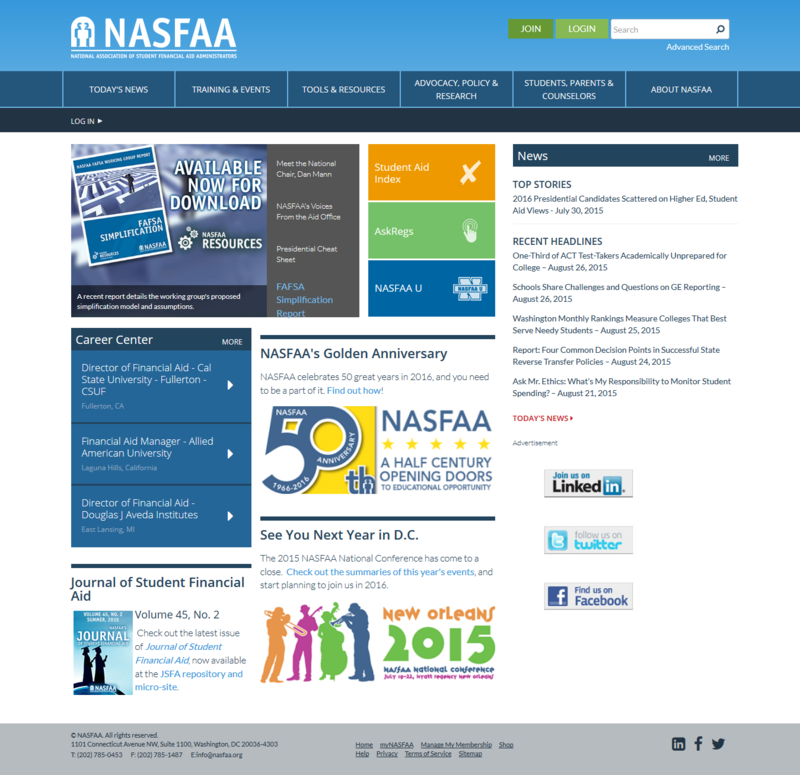 Modern Signal launches a new conference registration system for NASFAA, as the first feature in a new consolidated online store. The new store will serve as a one-stop shop for membership dues, conference registrations, webinars, courses, and much more. Modern Signal launches redesigned website for the NAHB International Builders' Show®, the world's largest annual light construction show. We are pleased to have partnered with NAHB for over 15 years on this and other projects.